Usually I post this blog after I have been to a Friday quilting. 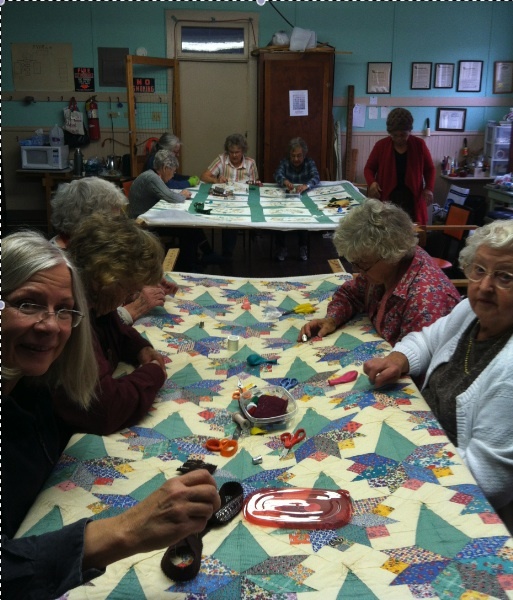 I am always so inspired by these women, the conversations, the colors and textures of the quilts, and the events in the old school house (which looks so innocuous from the outside) that it is easy to write. But this morning I am full of questions and look forward to taking them to those quilters who show up today. We won’t have the full contingent as some of the women are out of town visiting families but I know we will have enough there to work on both quilting frames and to give serious consideration to my questions. As is obvious from my lack of regular posts, I don’t do well balancing all I want to do in life. I want to spend more time making art, sitting on Fridays with the quilters, having serious conversations with friends, and spending quiet time reflecting. I mentioned this quest to have a better balance in my life to some young friends recently. They politely scoffed and said most people experience this – that their lives aren’t as balanced as they would want. Which surprised me as I had assumed in was my general lack of management and other people did much better. And even though the young friends see this as a common sentiment, I am not willing to let it rest there. I will take it as a query to the quilters and listen to their advice. The second question I will take to them today is about welcoming strangers into the community. Recently a couple from Cuba arrived in Eureka. It has surprised me the range of reactions that this has received. There are individuals who are generally welcoming and there are others who see it as completely wrong that our government would allow this to happen. As though even here in Montana with all the space we have that there isn’t room for two more. I finally got a photo of the quilt with names. It is for sale just in case you are looking for a Boxing Day gift. I surely would give this job of posting to anyone who has more consistency. Where has the fall gone? 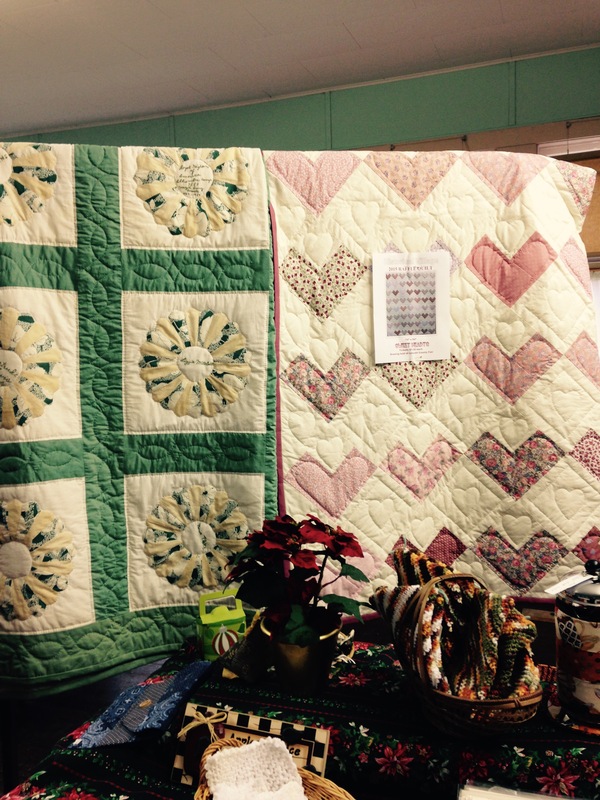 Last week was the holiday bazaar and we did well raising funds to help cover the costs of the Historical Village. Next Friday we will have pizza to celebrate Christmas and exchange small gifts. I barely made it to any Fridays this fall and the ones that I have managed to show up were too short. Quilts have come and gone. One lovely one that the group worked on – an old top that someone donated covered with squares containing names that women had stitched was finished before I really had a chance to even work on it. This week when I showed up there was a quilt I hadn’t seen before and I still haven’t heard the whole story of where it came from and who it belongs to. Gary stopped by this week. He shows up often on Fridays to say hello to everyone and check in as he is part of the Board of History. He told us he was having trouble with the kitchen sink in his house and would have to crawl under the house to fix a pipe. We all sympathized with him as of course no one enjoys crawling under a house in winter. Different suggestions were made….had he tried this concoction to get the drain going? Had he tried hot water? Had he tried snaking it out? He had tried most everything as of course he doesn’t want to crawl under his house to fix the pipe if he absolutely doesn’t have to. Finally one of the women shrugged and said, “We are usually pretty good at solving problems, but we aren’t going to manage this one.” We all laughed but I would easily agree that this group is remarkable at problem solving. Between them there is so much wisdom and plain old common sense: the medical knowledge from Cathryn and Bev who worked as nurses, the advice Mary Louise can give from running a ranch, or Bonnie from her years of work and raising a family. Cathy is a wiz at numbers and geography, Diane a stickler for details. Its not that I have any doubts about these women dealing with plumbing problems but in the end they agreed Gary would just need to go home and put on his overalls.